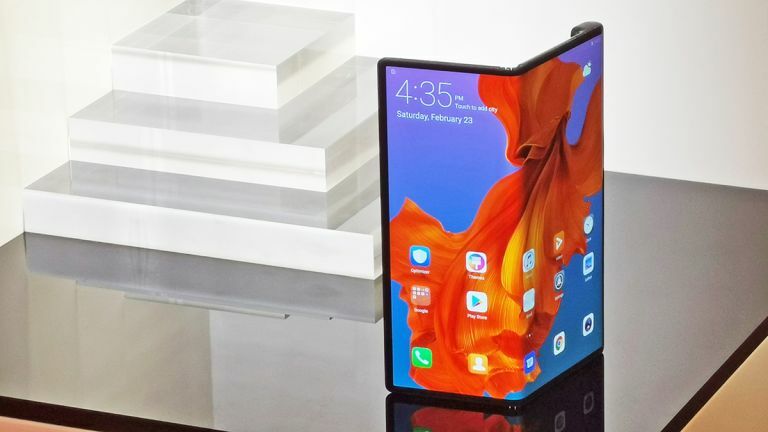 It looks like 2019 is going to be the year of the foldable phone, and we've already seen some stunning handsets appear –like the Samsung Galaxy Fold and the Huawei Mate X. After years of rumours and leaks, the tech is finally with us. Here we've collected together the very best foldable phones of 2019, both those that have already broken cover and those that we're still expecting. Read on for the hottest new devices with screens that can bend. At long last, after endless leaks and rumours, the folding Samsung phone is official: the Samsung Galaxy Fold has a 7.3-inch screen that folds over itself when you're ready to put it in your pocket. Out in April 2019, the phone is going to set you back a whopping $1,980 (that's about £1,515), but at least you get plenty of tech inside: a high-end processor, 12GB of RAM, and 512GB of storage. There's going to be a triple-lens 16MP+12MP+12MP rear camera, and a 4,380mAh battery split up into two sections (because of that fold). On the software side, Samsung says you can run three apps alongside each other on the Fold, should you want to. What's more, any app that you're running on the front of the device will seamlessly switch to the middle once you open it out. Want to know more? Then check out our early verdict Samsung Galaxy Fold review to see what we thought of it when we spent some quality time with it. The Huawei Mate X got unveiled at MWC 2019, and it folds the other way to Samsung's device – so the screen wraps around the outside, rather than being hidden away on the inside, when it's snapped shut. When opened out, you've got a full screen 8-inch tablet; when snapped shut, you've got screens front and rear, as well as a grip holding the camera technology. It's also thinner than you might think, and as well as packing some premium specs (including the Kirin 980 processor) it also offers 5G connectivity. Not a bad package. This is even pricier than the Samsung Galaxy Fold though: Huawei says the price will be €2,299 (about £2,000) when the Mate X goes on sale in summer 2019. If you like the look of it, you'd better start saving. We spent some time with the Mate X at MWC 2019. Read our early verdict Huawei Mate X review to see what we thought of it. Oppo doesn't officially have a folding phone yet, but what it does have is a folding phone prototype that we caught a glimpse of at MWC 2019 – and it's one that looks a lot like the Huawei Mate X.
Alas we don't know too much else about this phone, with the picture you see above most of what we have to go on. It looks like the hinge goes the same way as the Huawei device, and there's another bump grip you can see on the side. As for all of the specs, plus tech like 5G, we'll have to wait and see – but with foldable phones now going on sale to the public, Oppo won't want to be too far behind. The Motorola Razr is coming and, as confirmed in mid-April, it is indeed going to be called the "Motorola Razr", with the new folding screen device retaining the iconic name, as was rumoured back in May last year. And, from the noises that Motorola has been making, it's not going to be far behind Samsung and Huawei with a foldable phone, either, with Motorola Vice President of Global Product Dan Dery stating that the maker had "no intention of coming later than everybody else in the market." It's going to be a flip phone then, but with a full foldable screen inside when you open it up. These rumours have been around for a while. It was back in February 2017 that Yang Yuanqing, the CEO of Lenovo (which owns Motorola) told TechRadar: "With the new technology, particularly foldable screens, I think you will see more and more innovation on our smartphone design. So hopefully what you just described [the Motorola Razr brand] will be developed or realised very soon." One potential concept for the Motorola foldable phone. Since then we've seen Motorola file a patent for a two-screen folding phone that flips out to be used as a tablet. The patent describes two cameras, as well as hinges at the top, bottom and middle, and the ability to be propped up into a tent-like display mode. An unfolded screen size of 7 inches has been mooted for the Razr Motorola foldable phone. We've also seen these stunning concept renders of the 2019 Motorola Razr, too, which if anything have made the device feel even more tantalisingly close. In terms of hardware, the convo in the Motorola Razr 2019 rumour mill right now indicates the phone will come in two variants, one packing a Qualcomm Snapdragon 710 system-on-a-chip along with with 4GB of RAM and 64GB of storage, and another enlarging the RAM and storage to 6GB and 128GB respectively. What we haven't seen though yet is any leaked images of the actual Motorola Razr phone, so here's hoping that Motorola's desire not to come to market markedly later than its rivals comes true and we get an official announcement shortly. LG never likes to get left too far behind Samsung, and sure enough it's been one of the busiest companies in developing foldable screen tech – not just for phones but for televisions and other devices (see the image above). In recent months LG has confirmed it's working on foldable phones, without revealing too many other details. In fact, we think folding LG displays could be used by other phone makers, including Huawei. We were therefore very unsurprised back in January to hear that LG had filed a patent showing off a "mobile phone with a flexible display which can be folded in half", including the diagrams shown below. At the moment it looks like LG's foldable will feature just two screens rather than the Samsung Galaxy X's three: possibly with one of the screens making use of a transparent section, or perhaps with a camera system embedded in the back plate. Since that original patent filing we've seen names like Flex, Foldi and Duplex mentioned in internal LG documents. As for the final design, or the final price, we're still in the dark – it's going to be expensive, but LG has promised not to rush the device to market before it's ready, so a late 2019 launch could be possible. What we have in the meantime is the LG V50 ThinQ with a Dual Screen accessory – it clips on to add a second screen that you can use for something else, like gaming controls, or watching Netflix. It's not really a foldable phone, but it does kind of look like one, and it doubles as a case you can snap shut. It's also likely to be a lot cheaper than the true foldable phones, so it's worth looking out for when it launches later this year if you're after a hinged display on a budget. One of the more recent folding phones to get a teaser reveal is the Xiaomi MIX Flex, a prototype device that was famously shown off on camera by company president and co-founder Lin Bin. In the video reveal the Xiaomi handset is initially shown in tablet mode, but then both sides of the device are folded inwards at two points, leaving only the middle third of the phone on show. This design is markedly different to that of the other folding phones so far announced, potentially giving Xiaomi an edge in the folding phone market.